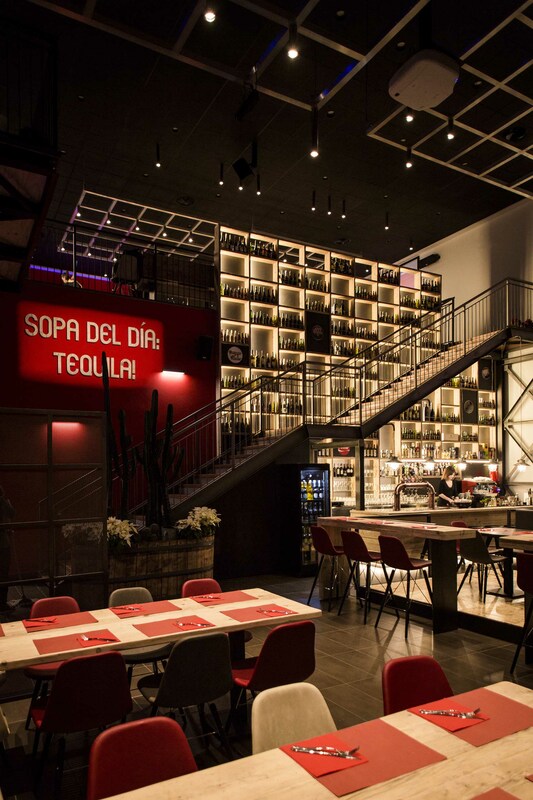 Osmar Zanin from Haus+ details the project for the new Mexicali restaurant. 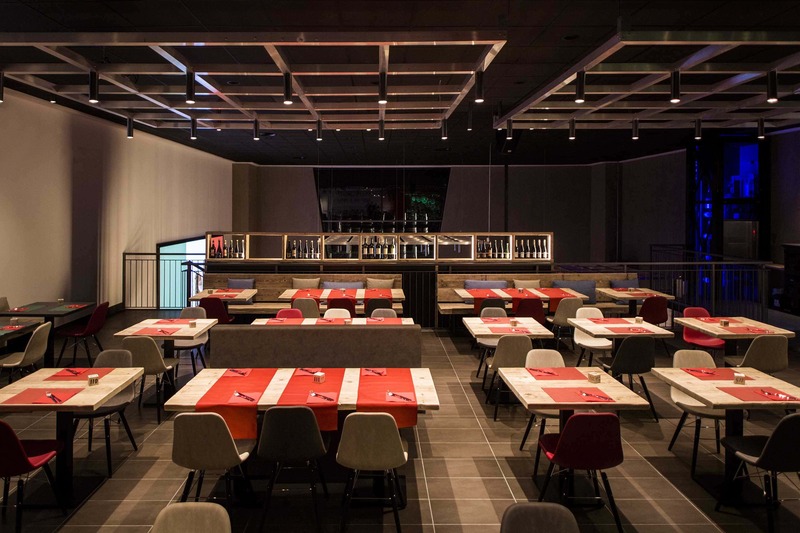 The search for spectacular solutions through LED lighting doesn’t compromise an informal atmosphere, ensuring the space to be the destination of those who wish to be surprised without sacrificing a casual and enjoyable evening. 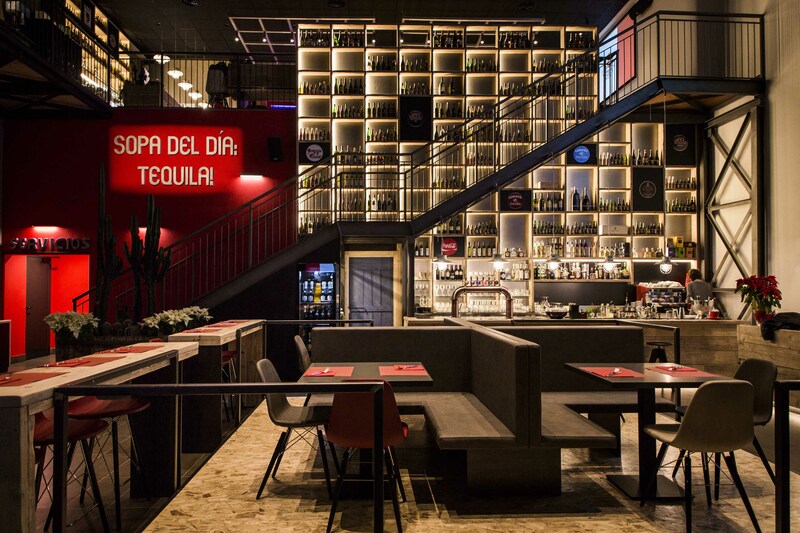 The new Mexicali restaurant, adjacent to the new multiplex cinema of Marano Vicentino, has been designed inside a very large space. The height exceeds 8 meters and the area holds about 170 seats. 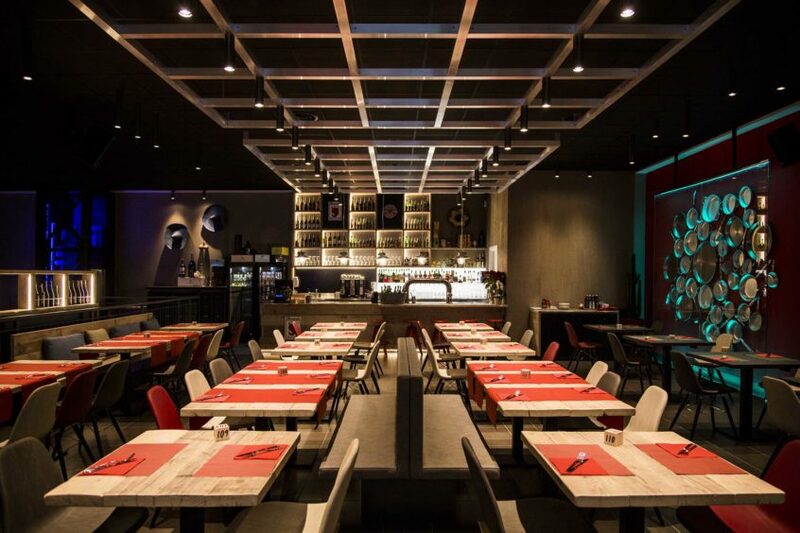 The restaurant is divided into two floors, complete with two bar areas, kitchen and service rooms. The materials used were mainly raw wooden planks and neutrally painted perforated sheet panels. 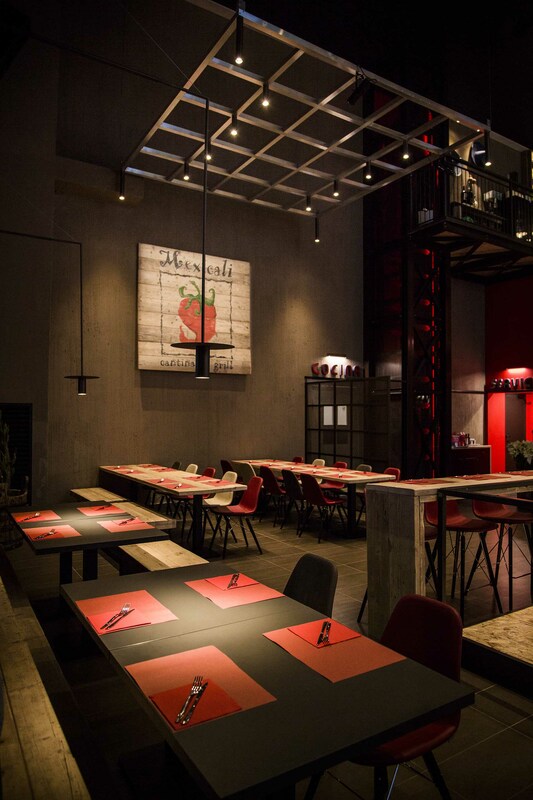 The walls are painted in warm earth tones intercepted by bright red colours, characteristic of the property’s logo, while the textile aspects are in shades of the colour of the walls. On the ground floor, a large central island accommodates the lounge area, enhanced by a series of lighting fixtures attached to a large metal lattice that seems suspended in space. The metallic lattice suspended in space is the main lighting element of the room. It’s repeated also on the first floor and enhanced by the anthracite colour of the sound-absorbing surface of the ceilings. On the first floor, the long wooden and steel table counter is opposite a large wall covered completely in “old pots” of tin, in different shapes and sizes, protected by an illuminated glass. The project has incorporated and exalted the characteristics of the building. 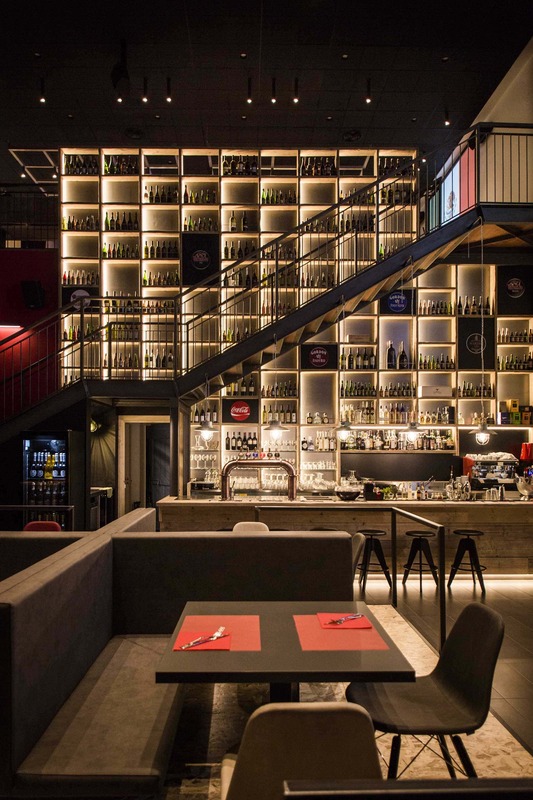 The significant height allowed the realization of a huge wine display which, traversing the staircase between the two floors, accompanies the customer to discover the restaurant. The wine display is a key feature of the environment. A theatrical backdrop, lit with full-height LED strips on the back of the large wooden counter. 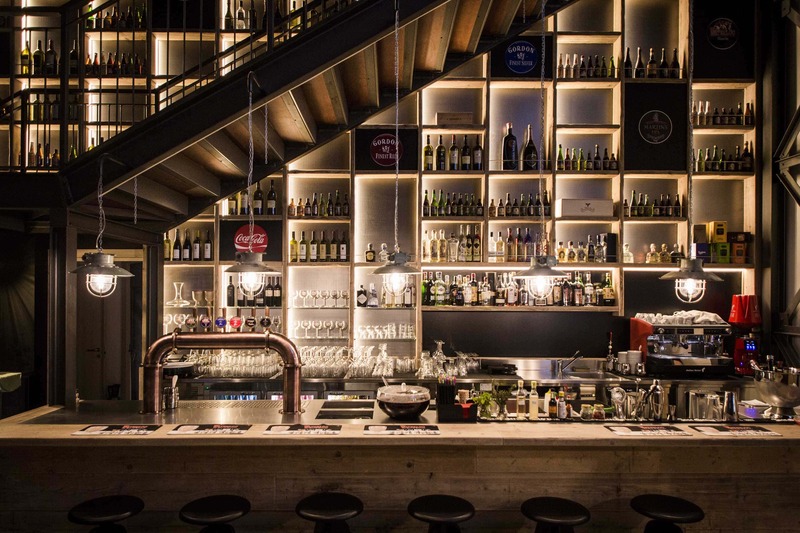 The combination of the staircase, wine shop and counter create an effective scenographic presence with a strong visual impact, the true totem of the whole environment. It captures the attention and makes the wall screens, of cinematic dimensions, to be useful without ever becoming invasive elements. The project aims to create the result of an informal yet refined, welcoming yet also slightly transgressive establishment. A location designed to accommodate a diverse clientele, who wish to be surprised, but who also seek the comfort and warmth of spending a relaxed and enjoyable evening. 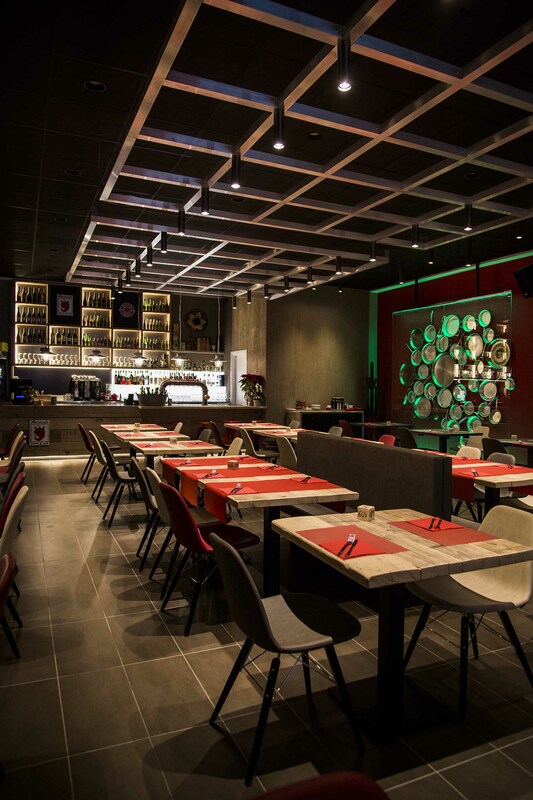 Are you an architect looking for designer lighting fixtures to create a successful restaurant design? Click HERE and download for free the latest Olev catalogue.